It’s been almost five years since I last posted here! Since my last post, about “Learning Scala” being published, I’ve been engineering at Netflix, Mesosphere, ClassPass and Twitch. Still doing Scala, but also Golang, C++, Java, Python, and management (is JIRA a programming language?). So much to write about now - container management! multitenancy! code as infrastructure! more Scala! The framework I previously used for this site, Octopress, was awesome but apparently isn’t runnable on my 2016 Macbook. I’ve rebuilt this site using the excellent Hexo JS static site generator, the Hexo-Next theme, and lots o’ custom CSS (Stylus, actually) because of course. Looking forward to adding new posts in April 2019! 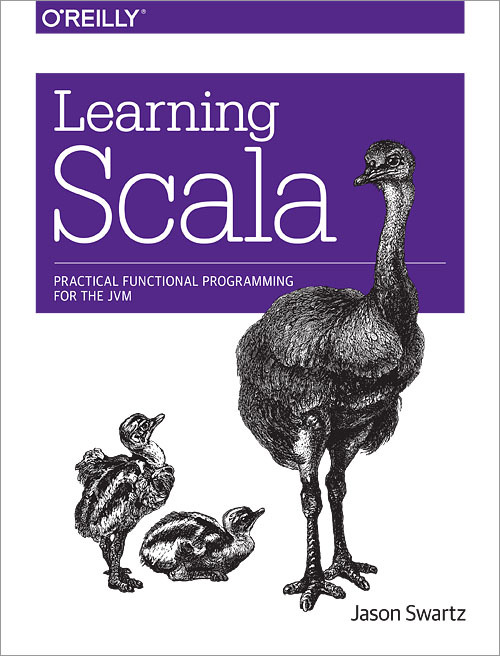 My first book, “Learning Scala”, has just been published by O’Reilly Media, Inc. I found the actual process of learning Scala as a seasoned Java and C++ developer quite challenging, and wanted to make it easier for other experienced developers to do the same. I hope this serves as a clear and readable introduction to the Scala programming language as well as the functional programming paradigm. For many developers, the first big hurdle in learning a new language is overcome when they can write and run a basic command-line application in an IDE. Although Scala developers can use the excellent REPL that comes with the scala app, being able to write and run an application in the IDE provides a comfortable foundation for the extensive learning curve of the Scala language (and of functional programming in general). This tutorial shows how to go from zero to running a basic “Hello, World” Scala application in Intellij IDEA 12 CE IDE (the free, open-source version of Intellij IDEA). The intructions cover OS X but should be applicable with minor effort on Windows and Linux systems. Download the free Intellij IDEA 12 CE IDE for your system and install it. The last downloadable, Intellij’s Scala plugin, is installed within the Intellij app. Right-click on the Scala plugin and choose *Download and Install” to install it. After closing the dialog and restarting Intellij you are ready to create the project. If the Project SDK dropdown is set to ““ click New.. to select your JDK installation directory. On the right side of the dialog select Set Scala Home and enter “/usr/local/scala-2.10.0” in the text field immediately below this option. You should see a message that you have selected version 2.10.0, and the Compiler library and Standard library fields should be filled out. When your project appears, click the 1: Project tab on the left side of the window to display the “Project” view. You can also select View -> Tool Windows -> Project from the menu bar. Even better, Intellij ought to have shown this view by default when you create a new project since you can’t get started without it! Open your project and right-click on the src folder, then select New -> Scala Class in the contextual menu. In the “Create New Scala Class” dialog enter the name “Hello” and set the Kind dropdown to “Object”. Click OK to create the new file. Now your new Scala object is ready, but it requires some work before you can execute it. Extend Scala’s App trait to make your object an entry point for an application. You can do this by changing object Hello to object Hello extends App . Add the idiomatic Hello, World statement. This simply requires writing println("Hello, World") in the body of the object. I hope you found this short tutorial to be useful. Note that although I have used Intellij IDEA in this article and recommend it for Scala development, many Scala developers prefer the Scala IDE for Eclipse IDE instead. That was easy! Option.get removes the Option wrapper and returns the inner value so you can get to work with it. Everything was fine when your method was returning the expected Some wrapper in development… unit tests… staging… and production. But then came an unexpected condition when None was returned and your code wasn’t expecting it. None.get will instead throw the above exception, probably in a place where you weren’t expecting to catch one. Use Option.getOrElse to provide a default value or behavior when your reference is empty. By providing a workaround for empty references, you are making your application sturdier and emphasizing how it handles unexpected conditions. Future maintainers of your code (and you should always plan for them) will thank you. And just in time for the new year! I’m giving up the old Wordpress-based blog and the now-obsolete posts there and am starting out fresh for 2013 with a new blog. This new blog is based on Octopress and sports a cleaner version of the old BKS2 Black Rock Desert mountainscape and a simpler design. Thanks to Brandon Mathis for Octopress and Dan Watson for his Category List plugin which will improve site browsing, assuming I write enough posts with fascinating categories.